RBTH introduces the 12 best places in Moscow to enjoy the spirit of the Russian spring - the city’s flowers during their brief and glorious blossoming. Moscow in the springtime is an incredible place. After months in monochrome, the capital erupts into color around late April and early May. Here are the 12 best places to enjoy the city’s flowers during their brief and glorious blossoming, whether your taste is for grand displays, cottage gardens or walks in the wild forests… . To the English philosopher Francis Bacon, a garden was the “purest of human pleasures … without which buildings and palaces are but gross handiworks.” It is certainly true that the magnificent parks that surrounded the palaces of Moscow’s czars and nobles have often proved to outlast the latter as attractions. If you mention spring flowers to many Muscovites, they will immediately think of the colorful displays in Kuzminki Park, in Moscow’s southeastern suburbs. The buildings of this 18th-century aristocratic estate are less memorable than the landscaped park and the avenue of flowerbeds that lay under leafy arches leading up to the front gate. The ranks of multi-colored tulips are cleverly staged to flower continuously from late April to early June. The park can be accessed from Kuzminki or Volzhskaya metro stations, and a walk along the shore of the ornamental lakes to the formal gardens around the Museum of Estate Culture is a treat at any time of year. The Alexandrovsky Garden next to the Kremlin was first laid out in the early 19th century, when the muddy Neglinnaya River was imprisoned in an underground pipe. The pathways are bordered every spring by ranks of tulips in strictly regimented banks of color. There are also purple lilacs and pink-white hawthorns, surrounded by beds of pansies. One of Moscow’s finest central springtime walks is through the Alexandrovsky Garden, across the Moscow River, and then left through the area known as Bolotnaya Ploschad (“marshy square”), with its flowerbeds, sculptures and fountains. Right across a much smaller bridge, the Zamoskvorechye area (“beyond the Moscow River”) is full of cafes, galleries and beautiful old churches. The Hermitage Garden is a tiny, central park with more than its share of romance and history. The “Novaya Opera” has its home here, Chekhov’s “Seagull” was first staged here, and, by late spring, it is overflowing with roses and sweet-smelling mock-orange blossoms. Outdoor stages and cafes, statues, pagodas and a giant metal heart complete the scene. You can walk here along the back streets from colorful Trubnaya metro station, with its backlit stained glass mosaics of famous Russian towns. Stroll along spacious Tsvetnoi Bulvar (whose name, “flowery boulevard,” refers to an old flower market here). Passing a collection of bronze clown sculptures — one of them riding on a unicycle through a fountain with rain pouring down from his umbrella — turn left past the circus and head west along Maly Karetny Pereulok. Another great, central place for spring flowers is the old “Apothecary garden” on Prospekt Mira. Moscow’s late spring means the crocuses, daffodils and tulips all come bursting out together. Around the winding wooden paths there is a lake of color: pink corydalis and white stars of Bethlehem, golden anemones and blue-grape hyacinths. The entrance fee is 150 rubles ($4.90) — quite steep for the garden’s size, but needed to fund ongoing restoration. The curators of the gardens, which were founded in the 18th century by Peter the Great, say they “try to select only the rarest and most unusual, but at the same time most beautiful, plants”. In 1945, the Russian Academy of Sciences laid out an enormous Botanical Garden in the north of Moscow. This is also a lovely place to stroll. 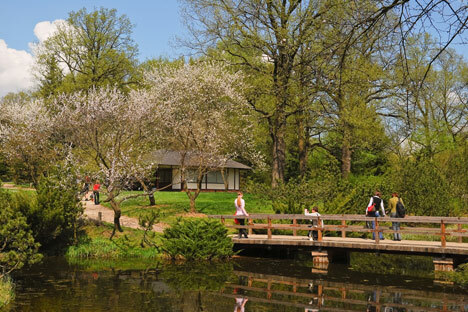 Apart from a few designated areas such as the Japanese garden, it is generally more of an arboretum, where wild flowers flourish under the trees. The Ostankino and VDNKh parks nearby also have a great mixture of natural and formal landscaping, with themed flowerbeds near the entrance later in the summer. To enjoy the some classic dacha gardens, take the “electrichka” (“electric/commuter train”) out of town in any direction. Peredelkino, for instance, just 20 minutes from Moscow’s Kievsky station, has gardens full of color. Boris Pasternak’s dacha here is surrounded by an overgrown tangle of flowering thorn trees, as if to protect itself from the sight of the monstrous new housing development across the road. The wooden cottages of Sokol “artists’ village” are at their finest in the spring. Individual gardeners take great pride in their work, and there are also flowers in the communal areas around the playground and community center. Take Moscow’s dark green metro line to Sokol station and walk past the memorial park behind All Saints’ Church to reach the village on the far side of busy Alabyana Street. The streets are all named after famous Russian artists and are lined with different kinds of trees. Snowdrops, the first crocuses and the blue stars of the flower known appropriately as “glory-of-the-snow” sometimes appear as early as March. Moscow’s large forest-parks have a rich variety of plant life. The carpets of wild flowers are particularly beautiful in May. One of the most accessible places to see this natural phenomenon is in Sparrow Hills, where the shade-tolerant yellow anemones spread under the trees starting in April. The forested island of Serebryany Bor (“Silver Bor”), in a loop of the river west of the city, is also another of the city’s nature preserves. You can get there by trolleybus from Polezhaevskaya metro; walking there beside the water is idyllic, if popular. Turn right after the bridge, along the island’s slightly less-visited north and eastern shores, to see delicate wild strawberries and pink dog roses, starry stitchworts, purple vetch and yellow archangels. Anton Chekhov’s “Cherry Orchard” must have some of the most memorable spring flowers in literature. The playwright planted cherry trees outside his wooden country house at Melikhovo, and there is still an annual theatrical festival held in May there, under the blossoms. But there is no need to leave town to see fruit trees “all in white.” The orchards in Kolomenskoye Park, 20 minutes from central Moscow by metro, are one of Moscow’s May marvels. The miles of flowering avenues, dropping petals like snow onto the dappled paths, make these riverside hills deservedly popular. The loveliest orchard is on the cliff top near the Church of St. John the Baptist — a 20-minute walk from Kolomenskaya or Kashirskaya metro stations, through ancient valleys and rebuilt palaces. More centrally, the apple and cherry trees in the Kremlin garden are often the first to flower, making a beautiful frame for the gold domes of Cathedral Square. The whitewashed, 16th century, Ivan the Great bell tower, seen through a wreath of blossoms, is one of the city’s most iconic spring sights.